Liam acquired his brain injury in 2012, when he was just twenty six. Two years later, in his late twenties, he’s still living with the effects – mainly on his memory and concentration and his ability to process information. Liam also experiences the fatigue that is very common following brain injury. He says, “I find I get very tired most days and walking and going up and down stairs was very difficult at the beginning.” The physical effects of Liam’s brain injury mean that he has to walk with a frame. Liam’s partner, Kristina, says that his short term and long term memory were very bad: “I find this sad as Liam can’t remember things from the past.” This is a common difficulty after brain injury, and can be very difficult for family members to come to terms with. Liam started at Headway in July 2013, attending one day a week to access a range of sessions to help him to cope with the effects of his injury. 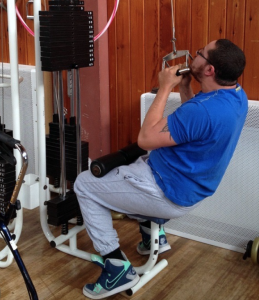 Liam was a regular weight trainer before his injury; he had a good build and was strong, able to lift heavy weights “no problem!” One of his sessions is in our gym with our specialist instructor. Initially Liam was annoyed that he couldn’t lift the heavy weights like he could before his brain injury. Kristina feels that since Liam has been using the gym and is getting physically stronger, his confidence has grown as well. He can now get up and down the stairs much better, faster and more safely, which means he is more independent. With two young children at home, this is an important milestone. Kristina says, “He can go upstairs on his own, he doesn’t feel like I’m mothering him and watching him all the time.” Liam says his goal is to get back to the size and strength he used to be and improve his ability to get around every day. He likes the gym and values the benefits so much that he’s now coming another day a week. 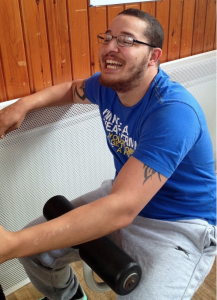 Liam also benefits from our Independence Support, with one to one support from a support worker to complete his home fitness programme once a week. Again this keeps him on track so that he doesn’t overstretch himself by progressing to heavier weights too early. 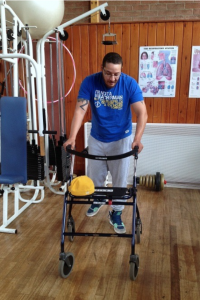 Liam is on a long road to improve the effects of his brain injury – but he can already celebrate the improvements he is making, all based on the foundation of work in our gym. “Means that he doesn’t have to ask everyone for everything anymore, doesn’t have to rely on others for everything, can do things for himself more. “He hates being told what to do!” – He’s more independent.